For the following project, an interdisciplinary design team collaborated with PADV leadership to recommend architectural design changes to one of their facilities through a human-centered design process. Domestic violence is one of the, if not the most unreported crime. This is due to the fear of the abuser doing the worst by seriously injuring them or their children, or even just because the woman loves her abuser. PADV is a domestic violence shelter whose mission is to end the crime of intimate partner violence and empower its survivors. For the following project, Georgia Tech's Service-Learn-Sustain (SLS) program performed human centered-design methods and research to better understand the need of PADV's Fulton County Shelter and then recommend design changes. Before visiting the facility, theteam conducted a literature search of other domestic violence shelters and other types of crisis centers. This gave a holistic view of crisis programming and helped serve as inspiration for design decisions. We also performed an analysis of the neighborhood around the facility. This included understanding neighboring buildings, their architecture, and environmental factors that would effect the final design. Next, the team underwent a series of site tours and interviews of the two PADV facilities. These tours allowed invaluable insights to be made into the day to day operations of the houses as well as seeing guests and staff members existing alongside each other. Clues were gathered as to the unique challenges these participants faced ranging from space usage to maintenance. Finally, one-on-one conversations with PADV staff and guests were conducted. These conversationswere instrumental in helping the team build empathy and a richer understanding of the PADV ecosystem. These interviews were coupled with conversations from professional architects, planners, and city leaders to help build a holistic picture of the system. To synthesize this content, a series of brainstorming and design synthesis classes were conducted. Affinity mapping, stakeholder analysis, and persona development were performed. After a the research synthesis, the team worked to arrive at a series of 5 key design goals. These 5 goals were then used to serve as the basis for design recommendations. 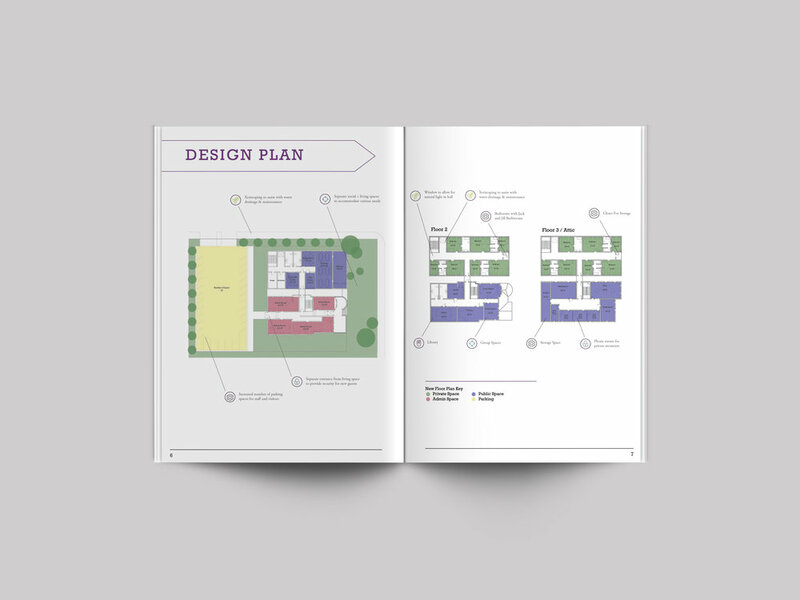 Following the completion of the project, research insights were turned into a print document that was shared with PADVs board and organizational leadership. The goal was that this document could be shared with PADV donors and other stakeholders in order to explain PADVs story and to raise money for construction.